Due to the fact that our parish of St. Joseph's is run and staffed by the priests of the Redemptorist Congregation, we are devoted to and endeavor to promote Our Lady of Perpetual Help, following the dictates of Pope Pious IX who encouraged us in 1866 to "let her be known. " Debido al hecho de que San Jose esta regida por los sacerdotes de la Congregacion Redentorista somos devotos y promovemos a Nuestra Madre del Perpetuo Socorro, siguiendo el mandato del Papa Pio IX que nos encomendo a "hacerla conocer" en 1866. There are many shrines of Our Lady of Perpetual Help (OLPH) throughout the world. Each shrine has an authentic copy of the original Icon of OLPH, which is in the Church of S. Alfonso in Rome. An icon is painting done on wood. The icon of OLPH conies from the island of Crete in the Mediterranean Sea. Who painted it and when it was painted has never been clearly established. It was brought by a Cretan merchant to Rome, Italy, in 1498. In 1499 it was formally placed in the Church of St. Matthew. It was known as a miraculous icon. As it was being moved to the Church in 1499, a man with a paralyzed arm was cured. It remained in St. Matthew’s until 1798, about 300 years. The Napoleonic armies had overrun Italy. In 1798, General Massena ordered St. Matthew’s and a number of other churches in Rome to be destroyed. The Icon was taken by the Augustinian Order who looked after St. Matthew, and was kept hidden for the next 68 years. The Church of S- Alfonso was built very near the site of St. Matthew by the Redemptorist Order. In 1866 Pope Pius IX ordered that the Icon be given to Redemptorists and placed in their Church at S. Alfonso. He also encouraged them to make Mary under the title of Our Lady of Perpetual Help (OLPH) known throughout the whole world. This they have successfully done and that is why there are many shrines to OLPH throughout the world. They are places of great prayer and devotion. One of the icons is located in the Church of St. Patrick in Toronto. In 1910 it was touched to the original Icon in the Church of S. Alfonso in Rome and blessed by Pope Pius X. It was then installed in the new Shrine Church of St. Patrick in Toronto- The devotion to OLPH continues to flourish at St. Patrick to this very day. Every Wednesday hundreds of people from all over the city of Toronto come to the Shrine to praise God and honour our Lady. They bring their hopes and prayers and thanksgivings. They leave with greater peace in their hearts. By Father John V. McGuire C.SS.R. Holy Mary of Perpetual Help” is the title which, according to an ancient document, the Blessed Virgin herself used in bringing her picture into the devotional life of Rome in the closing days of the fifteenth century. Thus, the Perpetual Help story is the story of a picture of Mary and her Divine Son, our Redeemer, and of the devotion to them which developed around it. Jesus is seen as preoccupied even from is tenderest years with the price he would one day pay in his Passion for our salvation, and Mary is seen as his compassionate Mother. Historically, the story of Perpetual Help is a story of people: an unknown artist who painted the picture on the island of Crete, a merchant who for some reason brought the picture to Rome in 1499, a friend of the merchant to whom he gave the picture and whose wife had visions of Mary, telling her she wanted the picture enshrined for public veneration in a little Roman church (of St. Matthew) between the two great basilicas of St. Mary Major and St. John Lateran. The next people in the story were the men of the religious community of St. Augustine at St. Matthew’s who received the picture with joy and soon found that it aroused great devotion among the faithful. There were many liturgies, impressive conversions, even miracles, so much so that the picture came to be called the miraculous image of Perpetual Help. Then, in 1799, all came to a grinding halt. The people this time were Napoleon and his general in Rome, Francois Massena. Besides carrying off the pope into exile, they ordered the destruction of some thirty churches. Among these was St. Matthew’s, The Augustinians moved to other monasteries and the miraculous picture went with them into obscurity. In time, the memory of the glorious days was all but forgotten. But not quite. Two new people enter the story. An old Augustinian Brother named Augustino Orsetti had a favorite altar boy, named Michael Marchi, who came to serve Mass at the monastery of Our Lady in Posterula. There, the brother, who had once been at St. Matthew’s, often pointed to a picture in the sacristy and told Michael that it was the famous Madonna, made homeless by the army of Napoleon. “Remember, Michael,” he would say. Michael remembered. He grew up, became a priest in the community of the Redemptorists (the next people of the story), who had just bought property in Rome (1855) and built a church in honor of their recently canonized founder, St. Alphonsus Maria de Liguori. Now, if only they could find the missing Madonna. And, wonder of wonders, there was among them Father Michael Marchi, erstwhile altar-boy, who had the answer. After a year of prayer, Father Nicholas Mauron, Rememptorist Superior General, petitioned Pope Pius IX for permission to have the miraculous picture enshrined in their church of Sant’ Alfonso. The Holy Father was so pleased that he wrote the directive there and then to the Augustinians to arrange for the transfer of the picture from St. Mary’s in Posterula to Sant’ Alfonso. Taking the pope’s wish as a command, the Redemptortists began shortly thereafter to preach on the history and meaning of the picture. In an amazingly short time, devotion to Mary under her title of Perpetual Help spread into northern Europe and here in America. As the Redemptorist congregation expanded, it eventually established missions on all five continents and wherever the missionaries went, they took the picture and its spiritual-message with them. As they preached, more and more did the story of the picture become a story of people. They are the people of the Perpetual Help World, people of the past and people of the present, preachers and listeners, prayers and doers, clerics and lay folk. All the popes since Pius IX have had special citizenship in this world. Pope John Paul II, was in fact baptized in the church of our Lady of Perpetual Help. Here are the great and the small, Cardinals and bishops on the one hand, Third World farmers on the other, canonized saints and would-be saints. We ourselves are somewhere in this picture, thank God. June 27 is our patronal feast. Hail Mary, Mother of Perpetual Help. According to ancient documents, the icon was originally enshrined in a church on the island of Crete where it was famous for many miraculous favors. How it arrived in Crete and who painted this picture is uncertain. What we do know is that, around the year 1450, the miraculous icon was stolen by a merchant of Crete and smuggled in his luggage by ship to Rome. Some time after the merchant arrived in Rome, he fell seriously ill. On his deathbed he confessed his crime and begged a Roman friend in whose home he was staying to have the stolen picture given to a church where it could be enshrined for public veneration. The friend agreed. But, after the death of the merchant, his friend’s wife refused to surrender the picture. Even after the Blessed Virgin herself appeared to merchant’s friend on four different occasions, he was unable to persuade his wife to give up the picture. Eventually, he also died. Again the Blessed Mother appeared to his young daughter on two occasions and told her that the Blessed Mary of Perpetual Help wanted her picture to be enshrined in the church of St. Matthew on Via Merulana, between the Basilicas of St. Mary Major and St. John Lateran. After the second apparition, the girl’s mother relented. The artist who writes the icon strives to illuminate the viewer’s soul with divine truth. 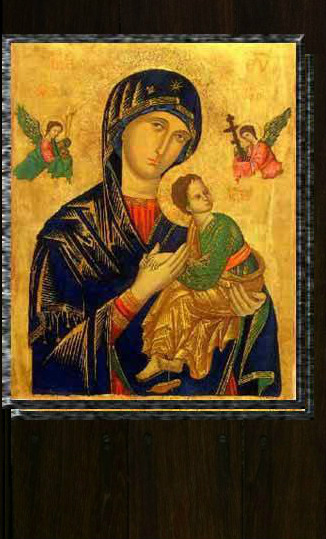 Below is a photo of the icon of Our Lady of Perpetual Help—the most widely known icon in the world. Each element of the icon has a specific meaning. Throughout two millennia, Mary has gone by many names. For sailors she was Star of the Sea; for contemplatives, a Mystical Rose; for students, Good Counsel; and for those in pain, Health of the Sick. No matter what you call Mary, she will always be Perpetual Help. Lately, we have needed her help more than ever before. Scripture informs us that Jesus’ first miracle was accomplished for desperate newlyweds at their dinner reception. Perhaps before water was blushed into wine, the first miracle was in fact that this couple chose to invite Mary and Jesus into the beginning of their life together. Mary’s perpetual help offers constant hope. Contemporary spiritual author, Father Ron Rolheiser writes that Mary turns hope into reality. Mary’s hope is not just about optimism or good feelings about the future. Mary’s hope sees beyond world events and life situations into the presence and promise of God. Mary’s hope comes from her trust in God. In one sense, the angel Gabriel’s message to Mary was incomplete. Mary did not know the full picture, the whole story. All Mary had were two angelic truths: She did not have to be afraid (Do not be afraid, Mary! ), and God’s promise would be with her (the Holy Spirit will overshadow you!). Pledged with this comfort, she could and would endure many hardships. And so shall we…. Like Mary, we do not know all the details of our life or the end of our life story. But like Mary we are given gifts from God. God is with us; we do not have to be afraid. This is hope become real. Whatever the title, whatever our situation, Mary will always be Our Mother of Perpetual Help, and an eternal source of hope.